Protection Scaffold secures construction personnel against falling as well as unfavourable weather conditions. 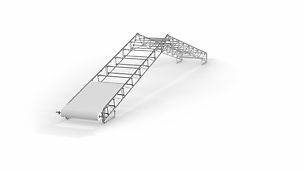 Furthermore, protection scaffold is frequently installed in order to protect site workers underneath or the flow of traffic from falling components or objects. In accordance with the different potential risks and dangers, there is a range of options available, for example, weather protection roofs or scaffold constructions complete with protective nets. Detailed requirements, such as the geometry, load-bearing capacity or roof area inclination, are normally defined in corresponding occupational health and safety legislation and standards. System solutions take into account these requirements as far as possible. Other project-specific needs are implemented using individual planning solutions.